Home/Candy & Sweets/Malt Whisky Fudge Plaid Gift Tin - 7 oz. 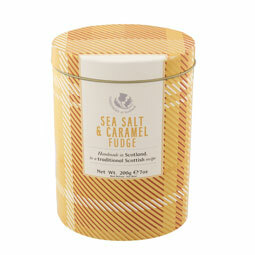 Gardiners of Scotland, maker of classic sweets, created this handsome plaid tin with scotch malt whisky infused fudge. Each of the 20 pieces is wrapped individually, just as you would expect. Perfect for a small gift, or a personal indulgence. This oval tin stands 5.5" tall. Ingredients: Sugar, Glucose Syrup, Sweetened Condensed Milk, Vegetable Oil, salt, soya lecithin. Flavorings include: raisins, Jamaican rum, malt whisky, chocolate and cocoa powder, vanilla essence, coffee essence CONTAINS: Milk, Soy and may contain nuts. 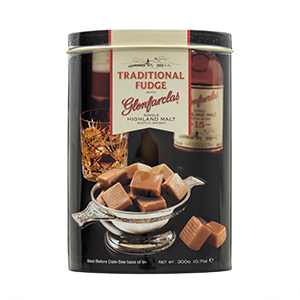 Gardiner's of Scotland is a family owned and managed company making classis toffees, fudges and butterscotch since 1949. Originally an ice cream company, they mae nougat wafers to complement the ice cream. Soon the confections became the stars, with tablet, butterscotch and fudges becoming the focus of the business. Two generations of Gardiners, both named Tom, run the business today.